16.72 Lbs (WxLxH) 19.29" x 15.63" x 6.88"
To start off I would like to say that my monitor did NOT come with a dvi cable. I just got mine and it only came with a vga and sound cable. Although I read that on some website if you call HP and ask for one they will send you one for free. I tested this out by calling HP and after about an half hour on the phone they overnighted me a free dvi-d cable! They are NOW sending dvi cables with the monitors, but if you happened to get one without a cable, call HP and they will mail one overnight at no charge. I've had the w2007 for about a month, and it's performed flawlessly. It's not an inexpensive monitor, so I'm a bit irked that HP didn't include a DVI cable. If your considering this monitor, remember to buy a DVI cable. Out of the box, with the included VGA cable, the monitor looked great. With a DVI cable, it's gorgeous...no noise or artifacts, brilliant color, and crisp text. Vista looks great, even with my $99.00 video card, and it's especially well-suited for photos and DVDs. It even looks great when it's off! Fast shipping, perfect condition, no dead or stuck pixels, small amount of backlight bleed at the bottom, there is a panel lottery, revision under service menu and on box label are ATGM24, ATG001. Don't know which panel, but it isn't the Samsung. Came with DVI connector. Didn't even check the speakers. I'm very pleased. Pics posted on [Hardforums]under same screenname as here. I have since upgraded my video card which solved the problem with the DVI connection. Still love my monitor, would probably go for a 24" next time. I hold new appreciation for my HP. I recently purchased a glossy screen Dell S1999WFP 19" monitor to use with a TV tuner and an old computer. The HP is superior in every respect. The Dell has stuck pixels, poor color representation, the text at the top level menus has shadowing/doubling, and it just doesn't seem bright enough. The corners of the monitor were dark, but the end of the menu bar was washed out. I didn't see any improvement with DVI over VGA. It is the worst monitor I've ever owned, and a waste of money. I originally bought a 19" Samsung 906BW because I didn't think my video card could handle the resolution of a 20" widescreen. After plugging in the Samsung, a slew of new resolutions appeared in my display adapter (ATI Radeon x300 with WinXP) so I decided to eat the $55 in restocking and return shipping fees and get myself a 20". I narrowed my choices down to the HP w2007, the Samsung 206BW (because I was pleased with the performance of the 906BW) and the Optiquest Q20WB because it was cheap and had the same specs as the HP. This time I paid a visit to a retail store to see the monitors in action. Immediately I was smitten with the glossy BrightView screen of the HP. (The Samsung wasn't hooked up in the store so I couldn't compare the two, but the HP had me at hello.) I was also concerned with the buzzing that some people reported after lowering the brightness on their Samsung 206BW. When I plugged in the HP next to the 906BW I was delighted with the crispness of the text thanks to the smaller dot pitch of the HP, and the extra real estate offered by the increase in resolution. 20" was definitely the right size for me, and I do not regret losing the money on the exchange. No dead pixels, some backlight bleeding. (The Samsung had neither dead pixels nor bleeding.) Reflections have not been an issue for me, unless I'm looking at an all black screen. My major gripe is that whites on the HP aren't truly white, and there is a noticeable color shift from white to yellowish-white as your eyes travel closer to the edge of the screen. It's almost as if the display isn't bright enough to keep the whites uniform. I tried making adjustments and color calibrating using the HP My Display software, to no effect. It is what it is. The Samsung had a much brighter screen, and whites were better. That surprised me because I read many reviews about how bright the HP was. I understand that color shifts and viewing angles are a concern with most, if not all LCDs at this point so it's something I will have to live with. These monitors are worlds better than my 10 yr-old CRT anyway. Just to make sure I didn't have a defective unit, I replaced it with another w2007 but there was no improvement. (By the way, the second HP, manufactured 5/07, came with a DVI cable.) I also have trouble with the monitor losing the input signal when using the DVI connection. Either there is a problem at boot up or I can't get it to wake after going to sleep. I don't have any difficulties when using the VGA cable by itself. A visit to the ATI website showed me the fault rests with my video card, and so far there is no solution. (Quite a few of their cards can't handle DVI, so be warned). Although I don't think it's fair comparing a 19" to a 20", the HP looks better on VGA than the Samsung did. The text on the Samsung with the VGA connection appeared smudged, but it cleaned up with the DVI connection. The HP has clean text on either connection, although it looks better with DVI. 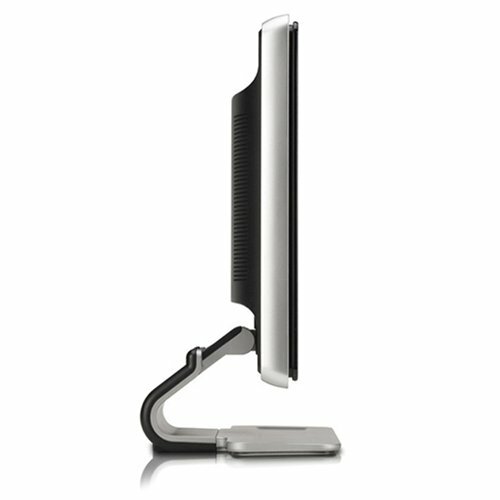 The 22" version of this monitor, the HP w2207, comes with a height adjustable stand and USB ports, but the resolution is the same and the dot pitch is larger. I had also read a number of reviews where people who had originally purchased the Samsung 226BW had returned it for the HP w2207. I think it comes down to personal preference, if you want a glossy screen and are willing to pay a premium for it. I imagine I would have been happy with either of the two monitors mentioned above had I not been seduced by the BrightView display. The other thing is the Samsung comes with a three year warranty, the HP and Optiquest, only one year. I received this display as part of a bundle with an HP desktop. The desktop is fine but I'd say the display is the best part of the package. It's very bright and the colors are quite nice. As is the fashion these days the screen has a glossy coating. Some people don't care for this as it does pick up more reflections. This screen is no exception but I have not found it to be a problem. I have used the display under Windows Vista, Windows XP and Ubuntu Linux. In all cases it works flawlessly at it's native resolution of 1680 x 1050. At first I didn't have a video card with a DVI connector so I used the analog. The display looked great and I never noticed any ghosting. I eventually replaced the video card and am now using the DVI connection. Either option looks great. The monitor has built in speakers but I've never used them. HP Did This One Right. I own three of these monitors. That tells you just how much I like this product. The monitors are very bright, the colors are very vivid. They were very easy to assemble (basically this is attaching the base). All three of mine came with both DVI, VGA & sound cables. The built in speakers are clear, but not very loud even at full volume. I do wish that you could adjust the height of the monitor, not just the viewing angle. Other reviews have mentioned the base. I haven't had any real problems with stability, but I do wish that that the base was more substantial. One is attached to a Mac Mini. I did have some problems getting the Mac to work with this monitor. I ended up having to use the VGA connection along with the Apple supplied VGA to DVI adaptor. I also had to download a piece of shareware software in order to get the Mac to run at 1680 x 1050. This is one of the reasons I gave the device four stars instead of five. The other two monitors are attached to a KVM switch that supports dual monitors. Thru the switch the monitors are connected to a HP laptop that runs Windows Vista and a HP desktop that runs Windows XP. I haven't had any problems toggling between the two devices. I've had two of these monitors for about 1 year, the other for only about two months. The price has dropped about 20% during that period. If it would get to about $175 I'd add another star to my review. I'm one of the ones that also did not receive a DVI capable in the box, but I did pick up a capable at Best Buy for like $20. For my budget, I like this screen. It's much better than my old Apple Display. However, I'm very concerned about the color resolution. While the colors are good, I highly suggest that if you doing lots graphic/photography work, that you color calibrate this screen. I used Apple's internal process (found in System Preferences) for color calibration, but I plan to get a special color calibration tool to see if I can get even more accuracy.